Vada's Blog Stamp Inks and Paper : GCSP5: “Blue Moon”, is Quilt Patterns. For my card I went with the “Herringbone TQ from Dec. 2009 newsletter,and Cuttlebug highlights. I used Spellbinders Squares to cut the frame and on the inside I used a punch to add lace work to my tablecloth. The Herringbone block was 2”x 2” square, stamps are from, Stamping Up, Kitchen Sink Stamps and Great Impressions. My image was colored with Copic’s. 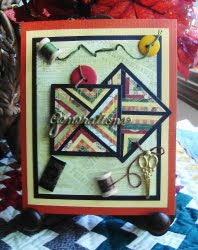 For the second card, It’s the Mini Herringbone pattern again , background image is from A La Carts Art Stamps. Thanks so much for stopping in today. 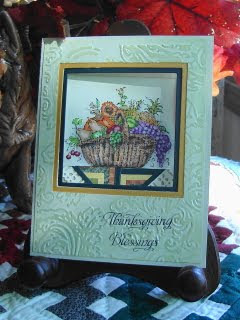 Take a few minutes to stop in at Gingersnaps Blog to see the wonderful cards done for this challenge. I don't know how I missued this on Friday!! Breathtaking!!! Both of your cards are just gorgeous! Love them! What in inspiration, lovely! Your colors and style are absolutely wonderful. Seriously amazing artwork my dear! Your cards are amazing. 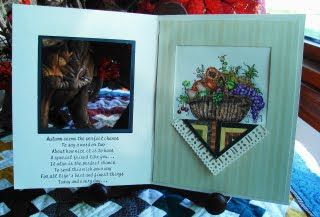 Love the quilt card with the fruit basket. What stamp did you use for the basket?